EECS research, funded by the EPSRC, features in this year’s Parliamentary Report on R&D in Assistive Technology. The Collaborative Cross-modal Interfaces (CCmI) research team, which was led by Nick Bryan-Kinns and included Tony Stockman, Oussama Metatla and Fiore Martin, examined how support can be developed for collaboration between visually impaired users and sighted users, focusing specifically on how to collaboratively edit diagrams. 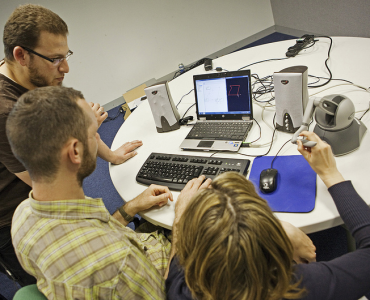 The CCmI project explored the use of input and output technologies that use multiple methods (modes) of communication, such as sound, haptics (touch) and graphics. The opensource CCmI editor is available as a free download. The report, Research and Development Work Relating to Assistive Technology, is now published on the Department of Health website.